Also, some of the practices tests are from popular exam simulator providers like Whizlabs, Enthuware, EPractizeLabs, and others. They provide practice tests so that you can check the quality of their material before buying them, which is very good. But, if you are not buying any exam simulator and just want to continue preparing using books with some odd practices tests here and there then this collection is quite useful. The collection contains free 1Z0-808 practice tests, 1Z0-809 practice tests which are useful for both 1Z0-810 and !Z0-813 upgrade exams because they share the same syllabus. Unfortunately, these questions are not available in PDF format and they are only available online, so you need an internet connection to access these free tests. Btw, these are not Java SE 8 certification dumps. I hate dumps because that makes you lazy and doesn't prepare you well for exams. Remember, you are getting certified not just for recognition but for gaining knowledge also. In the professional world, recognition without knowledge has no value, hence it is better you avoid any kind of OCAJP8 or OCPJP8 brain dumps. Whizlabs provides one of the best software to prepare for Java 8 certifications. These practice question or free mock test is a good opportunity to evaluate their product before purchasing. This list contains 25 questions. You can take the mock test online after entering your name and email address. The questions are based upon all 9 exam topics and a good tool to test your strengths, weakness, speed and accuracy level. You have to finish the exam in 48 minutes including review. It also provides correct answers with explanations. The also gives you unique discount offer when you complete their free tests. This is again one of the best free mock test available for OCPJP 8 Exam or 1Z0-809 certification. You will have access to 20 quality questions based upon 8 exam topics of OCAJP 8 certification. The online simulator includes timer and you will get 40 minutes to solve these 20 questions. You can check your speed and accuracy, strength and weaknesses as well as quality of Whizlabs exam simulator before buying their full length test. The test also include correct answer and explanation. If you lucky you can also get some whizlabs discount coupon to buy their full length test by doing free test. You can take the test online, it also includes a timer to check your speed and accuracy. You can also download 1Z0-808 dumps as PDF for offline reading. Good thing is you don't need to register for downloading 1Z0-808 dumps like other site, you can just download and use. Correct answers of practice questions are also provided with explanation. David also gives 50% discount on his test if you share your result on Social Media e.g. Facebook. This is one of the best free resources available for 1Z0-809 or OCPJP8 exam. It contains 25 questions which you can take online. The site includes timer and ask you to solve 25 questions on 45 minutes, which is a good way to test your speed and accuracy before real exam. Another good thing about this free mock test is that all the right answers are provided with perfect explanation and a link for further studies. 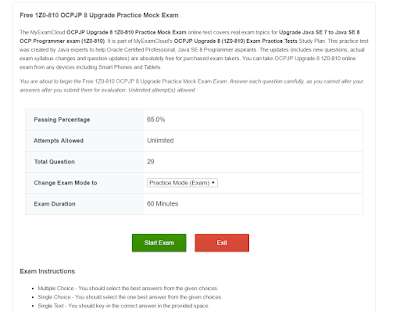 The MyExamCloud OCPJP 8 1Z0-808 Free Mock test covers real exam topics for Java SE 8 Programmer I exam (1Z0-808). It is part of MyExamCloud's OAPJP (1Z0-808) Exam Practice Tests Study Plan, earlier known as EPratizeLabs. This mock test was created by Java experts to help Oracle Certified Professional, Java SE 8 Programmer candidates. The updates (includes new questions, actual exam syllabus changes and question updates) are absolutely free for purchased exam takers. You can take OCPJP 8 1Z0-808 online exam from any devices including your mobile phones and tablets. The number of questions are good enough to check your speed and accuracy. This is again a good free mock tests for Java 8 certifications like OCPJP 8 or 1Z0-809 exam. The test contains 29 questions you can solve online by logging using Facebook, LinkedIn or Google Account. You will get 60 seconds to solve these 29 questions and online test simulator includes timer. You can take the test in practice mode or as a learning quiz and there is no limit on how many times you can take test. This is the same MyExamCloud or EPractizeLabs practice test but for 1Z0-810 or Java SE 8 Upgrade exam for Java SE 7 Certified programmer. Again, you can use your Google, Facebook, or LinkedIn Account to sign in and then take their test online with real exam like scenario. Passing score is 65% and you will get 60 minutes to solve this question. Choose your answers carefully because you cannot alter them after submission. 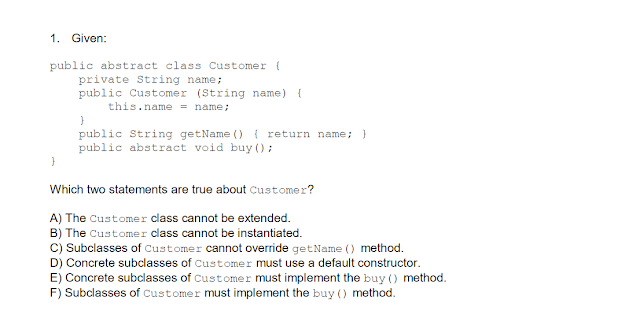 This practice test contains 15 java questions with answer explanations to help you test your Java skills and prepare for the Oracle Certified Associate - Java Programmer exam. The Oracle Study also provides commercial exam simulators for Java 8 certifications. This list is a set of sample questions to get an idea of their product. The list contains 10 relatively simple questions on the exam topics of 1Z0-808 or OCAJP 8 exam. Answers are also provided but no explanation. These are official sample questions for the OCAJP 8 certification exam, 1Z0-808. This include just 8 questions but they are real quality and gives you an excellent overview of type and difficulty level of real exam. I strongly recommend to solve these questions. These are again some OCPJP8 or 1Z0-809 practice questions from Oracle itself. Similar to 1Z0-808 sample questions, this also contains just 8 questions but again you can use them to get a feel of real exam. You can also check the answer at the end of PDF. 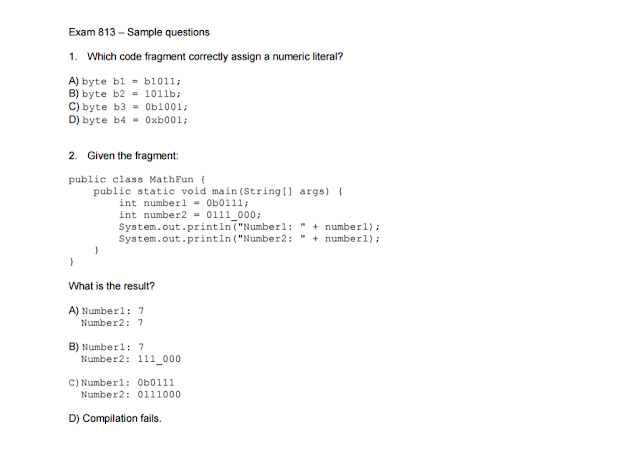 These are sample questions for 1Z0-810 or Upgrade Java SE 7 to Java SE 8 OCP Programmer exam. It also contains just 8 questions but they are good enough to give you an overview of type and difficulty level of actual exam. Answers are also provided at the end of PDF. These are sample questions for 1Z0-813 exam or Upgrade to Java SE 8 OCP ( Java SE 6 and all prior versions). Similar to previous sample questions, it also contains just 8 questions. The right answers are provided but without explanation. 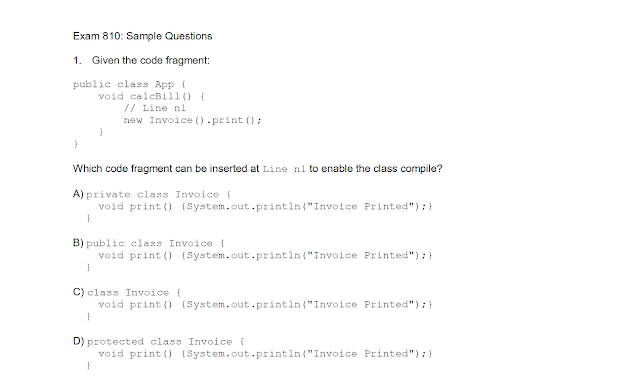 So these were some of the sample questions and free online mock tests for Java SE 8 certification aspirants. I tried to include some of the best free resources for 1Z0-808, 1Z0-809, 1Z0-810, and 1Z0-813 certifications. That's all about some of the best OCAJP 8 and OCPP 8 practice tests which are available for free of cost. Btw, I strongly suggest you buy at least one full version of mock exam for better practice. If you are already spending 300$ USD then why not spend just 10$ or 20$ more to get a professional quality mock exam for better preparation. You can get Whizlabs exam simulator at 19.90$ for limited time period, which is great value for money. You surely don't want to spend another 300 USD on retaking the exam, hence prepare it once and prepare well.